P-Max is a navigation formula for teams in the urban and town belt areas of Wellington and Hutt Valley. Events are 60-90min long. Sometime they form a series, sometimes they are one-offs to introduce beginners to rogaining. They are ideal for experienced navigators to introduce their families and friends. Or for beginner adventure racers who want to develop their navigation and teamwork. It also gives you the confidence to go into individual orienteering. In a rogaine you choose your own route to visit checkpoints within a time limit. There are usually too many to visit them all, but each has a points value and you try for the highest score. Get back late and you lose points. Make a plan, find your way, and adjust to get back on time. P-Max areas are easily accessible, but get you into the Wellington bush (see below). Checkpoints are on or near tracks, and you'll need to navigate junctions accurately. This is the type of navigation you'll get in yellow level orienteering courses, or longer rogaines. Our maps are the same style - like the topo but more accurate. Sunday 10 Feb P-Max Avalon 1hr Sunday event in broad daylight. Get the hang of planning a route and navigating with a team. Lower Hutt, flat plus optional river crossings. More beginner rogaines will be planned, some on mountainbikes! Longer Rogaines 3hrs 3hr afterwork rogaines run each month for experienced rogainers and athletes wanting a longer distance. But there's NOTHING to stop you finishing early - gets you into new parts of the city. Big-time rogaines last up to 24hrs!! The Big Trig is an all-day rogaine that OHV runs late in the year. The 2018 edition was all round Wainuiomata, use the link to read about that event. There's also a 24hr rogaine somewhere in NZ each year. Can't make it? After the event you can download the map and checkpoint list. Grab some friends and do it when it suits. 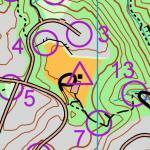 Visit the "Anytime Orienteering" page. ORIENTEERING: "involves finding your way through unfamiliar terrain using a map." Competitions are usually individual, but groups are welcome too. Checkpoints may have to be visited in a certain order, or a time limit is set. Courses can take anything from 10 minutes up, with an hour quite common.